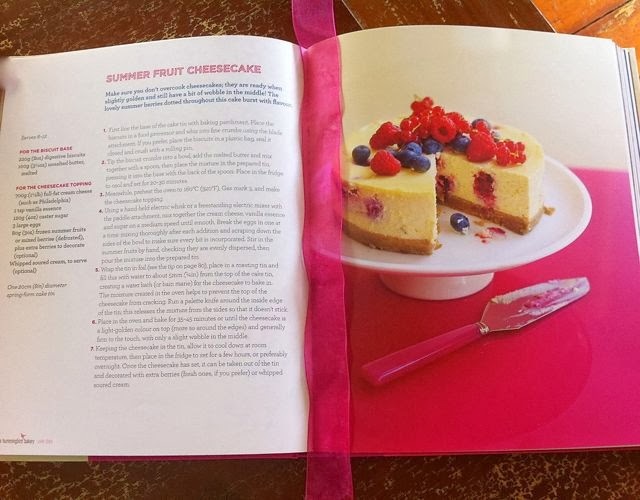 Our Wee Farm: Summer fruits cheesecake - The Hummingbird Bakery. I have a confession to make. I have never made a cheese cake before. Baked or otherwise. But I do love them. I treated myself to a new baking book - The Hummingbird Bakery, Cake Days. And oh my! 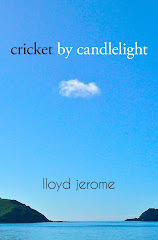 It is wonderful. In it there are a few baked cheesecake recipes. So I thought, How hard can it be? Not terribly, it would seem!! First one I fancied was Summer Fruit Cheesecake. First line the base of the cake tin with baking parchment. Place the biscuits in a food processor and whiz into fine crumbs using the blade attachment. If you prefer, place the biscuits in a plastic bag, seal it closed and crush with a rolling pin. Tip the biscuit crumbs into a bowl, add the melted butter and mix together with a spoon, then place the mixture in the prepared tin, pressing it into the base with the back of the spoon. Place in the fridge to cool and set for 20-30 minutes. Meanwhile, preheat the oven to 160C/140C fan/gas 3, and make the cheesecake topping. Using a hand-held electric whisk or a free-standing electric mixer with the paddle attachment, mix together the cream cheese, vanilla essence and sugar on a medium speed until smooth. 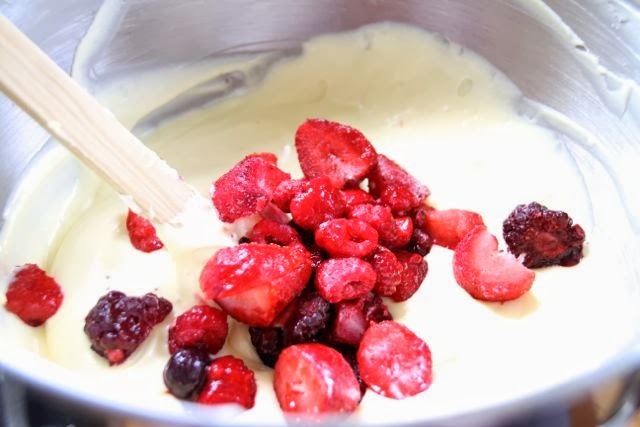 Break the eggs in one at a time, mixing thoroughly after each addition and scraping down the sides of the bowl to make sure every bit is incorporated, Stir in the summer fruits by hand, checking they are evenly dispersed, then pour the mixture into the prepared tin. Place in the oven and bake for 35-45 minutes ( mine took nearer 55 minutes) or until the cheesecake is a light golden colour on top (more so around the edges) and generally firm to the touch, with only a slight wobble in the middle. Keeping the cheesecake in the tin, allow it cool down at room temperature, then place in the fridge to set for a few hours, or preferably overnight. (there was no way on earth mine was going to wait overnight! Not a hope!) 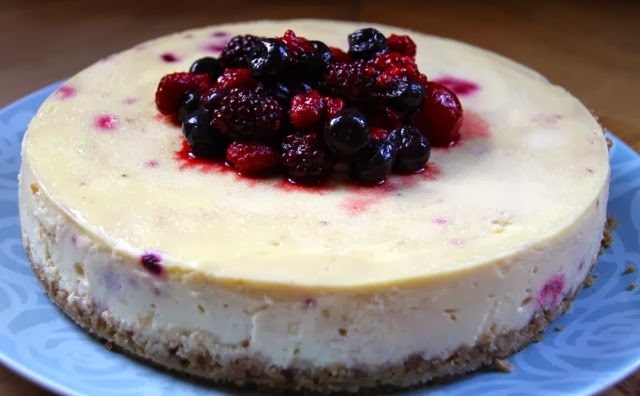 Once the cheesecake has set, it can be taken out of the tin and decorated with extra berries (fresh ones, if you prefer) or whipped soured cream. 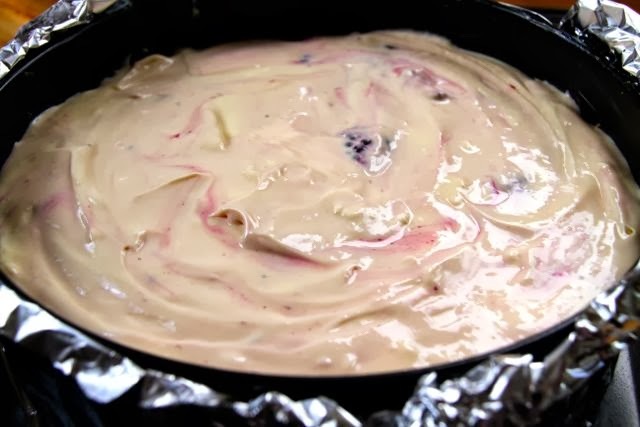 TIP To prevent any water leaking into the cheesecake while it is baking, place the filled cake tin on a large piece of foil and fold it up around the sides of the tin. Then place the cake tin in the roasting tin and fill with water, as described above. OR! I found that water still got in - not that it appeared to make the slightest bit of difference - but I then read that you could put it in one of those oven bags...the choice is yours. Not too shabby for a first attempt. I kept reading how difficult people thought a baked cheese cake is, but all I did was follow the recipe, step by step and it came out absolutely perfectly. If you haven't made one before, don't be put off - just give it a go! Oh also! 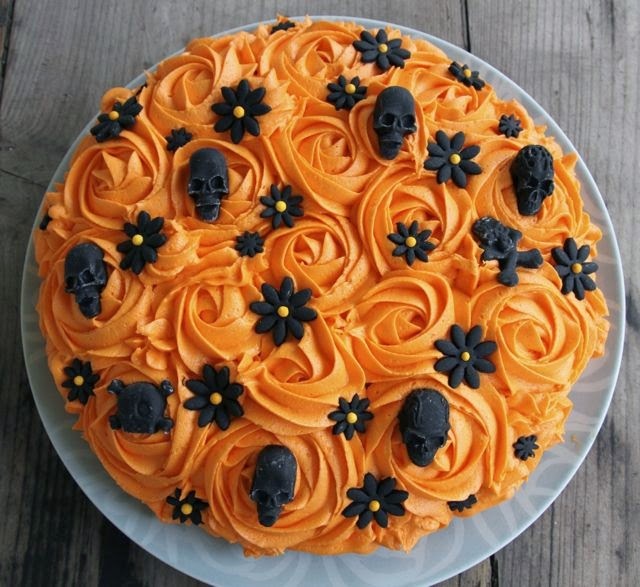 just cos it was Halloween this week - I made a scary cake! It was just a very simple lemon sponge with lemon butter cream frosting. But I made it orange. Then made a lot of black fondant decorations - I particularly like the skulls! Since Halloween was on Thursday I took it down to roller derby training. It went down rather well! 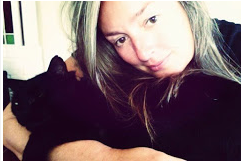 Hi Jen, I just spent hours yesterday catching up on all your stuff!! 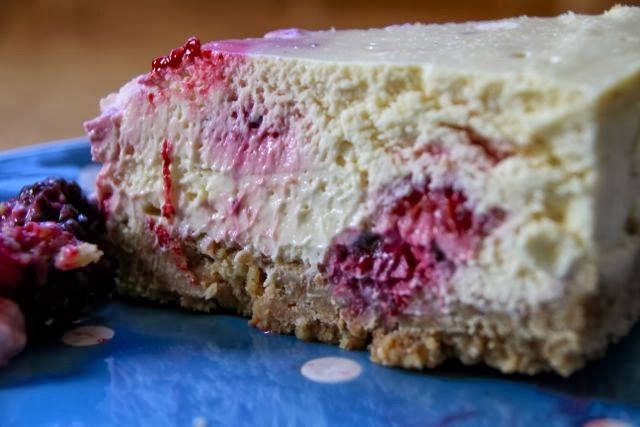 I found the crock pot cheesecake recipe :) Im just wondering if I could do it. Our slow cooker is an oval shape and I dont think I have anything that'll fit in it! I've always liked them. Not something I've had often though. Also I had just assumed they would be terribly difficult to do, and it just wasnt! More to come I reckon! You make some amazing treats, Laura! That cheesecake looks divine!